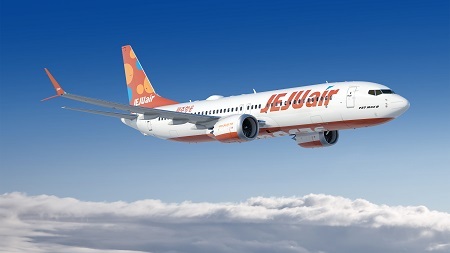 The leading low-cost-carrier from Korea, Jeju Air has signed on the dotted line and confirmed a large order with the US plane manufacturer Boeing. The budget carrier and founding member of the Value Alliance has put in a firm order for 40 of Boeing's new 737 Max 8 aircraft the planemaker confirmed on Tuesday, November 20th. today. The deal valued at USD$5.9 billion at list prices or $2.6 billion at real prices, also includes an option on a further 10 aircraft and is the largest Boeing order from a Korean low-cost budget carrier. This order marks a significant investment for the airline based on the South Korean island of Jeju, where the carrier takes its name from. The airline has achieved over 25% sales growth each year for the last five years and recorded 17 consecutive quarters of profitability. The airline hopes the new 737 Max will be able to further enhance its already successful operations using the 800 series of the narrowbody twinjet. "With Korea's growing commercial aviation market, we are excited to take the next step in expanding our business with the 737 MAX, a world-class aeroplane that will allow us to improve our operation and continue to provide a safe and enjoyable experience for our passengers," said Seok-Joo Lee, President and CEO of Jeju Air, adding"The 737 MAX 8 and its superior performance and economics make it an ideal aeroplane to implement our growth strategy as we look to expand beyond Asia in the coming years." Jeju Air has been going since 2005 and has rapidly grown to operate 40 aircraft on 200 flights every day to over 60 destinations, both in South Korean and across the region. The carrier is a founding member of the Value Alliance, the first pan-regional low-cost carrier alliance based in Asia. Other airlines in the alliance include Scoot, Nok Air, NokScoot, Vanilla Air, Cebu Pacific and Cebogo which cover more than 160 destinations from 17 hubs across Australia, North Asia and South East Asia.